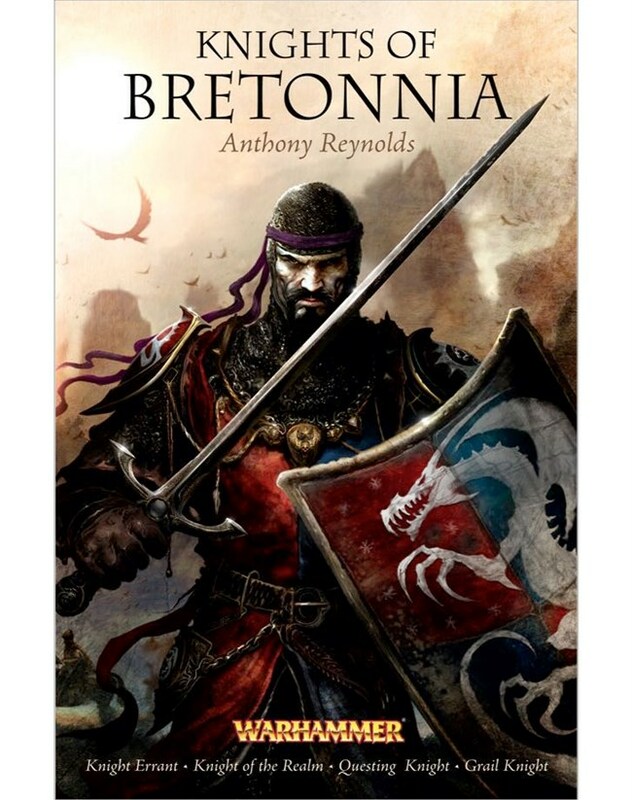 Lord of the Night AND Bane of Kings review the fantasy epic Knights of Bretonnia omnibus by Anthony Reynolds in a double review! Anthony Reynolds may not have very much written for Black Library when compared to Dan Abnett and Graham McNeill, but its all quality stuff and Knights of Bretonnia is no exception. With two novels Knight Errant and Knight of the Realm, bolstered by two brand new novellas Questing Knight and Grail Knight. If you like chivalrous knights, fearsome foes and dangerous quests, this is not a series to be missed. When the young Knight Errant Calard of Garamont and his brother Bertelis are sent to aid in a border war against the greenskins the story begins the quest that will send Calard across his homeland Bretonnia and the Old World in search of his goddess, the Lady of the Lake, to drink from her grail and to become one of Bretonnia’s most revered warriors, a Grail Knight. But the Lady’s quest is no easy feat, the quest will see him face the worst nightmares of man and the dark beings that even the older races fear, and confront a destiny that will have him defy his past, present and future. The characters in the novel are interesting, however there are elements of them that while well written, make it slightly harder to agree with them. Calard of Garamont, the protagonist, grows through the series beginning as a young Knight Errant eager for glory and striving to prove himself, and as the series goes on Calard begins to show the growth over the story until he becomes a figure worthy of respect and admiration. His adamant dislike of peasants for no reason other than their low-birth is annoying but that is typical of Bretonnians, but Calard is better then his brother about that. The supporting characters in the series are wonderfully varied. Calard’s brother Bertelis the lazy, care-free knight grows as much as Calard but his path leads down a much different road. The hunchbacked peasant Chlod is endearing to read as he attempts to survive his horrific luck and bribe, steal or murder his way into a comfortable life. Each character is quite interesting and seeing them grow through the series, characters dying and new arrivals becoming a part of this epic tale was very enjoyable. The foes that Calard must face would make even a Dwarf pause. From wyverns to the ghoulish undead, the beastial greenskins to the tainted beastmen and several foes who will genuinely surprise you as they reveal themselves, and some that its hard not to root for, the villains that Calard faces are unique and definitely good additions to the series. The action is very engaging, Calard being a knight there are charges into enemy lines galore and duels between peerless warriors, champions of their gods and mighty beasts that shake the earth with every footstep. Calard’s skill grows along with his character and as the series progresses it becomes clear that Calard has grown, and is becoming a grand swordsman and knight. Plus the stampeding charge of a thousand knights on horseback is just awesome to picture, the thundering of hooves and the the clash of blades as both sides meet. The pacing was quite good, the series progresses at a steady rate and Reynolds’s handles the timeline quite well. Calard does age through the series and the passage of time is handled very well. Running Calard and Chold’s own storylines against each others could have been hard but Reynolds makes sure that each story contributes to the other until they merge together into one. The ending of the series is fantastic, it had the perfect setting and ended in just the right way. Though the outcome of the ending can only be solved in our imagination, I think we all know who won in the end. The Old World is a dark place, but sometimes heroes do prevail. I give Knights of Bretonnia a solid 8/10, it has its flaws such as the constant reminder that peasants are beneath knights, the occasional grammatical error, the most glaring of which occurs in Grail Knight when Calard’s two named horses Gringolet and Graibor are mixed up, despite them both only appearing in one novel each. But these don’t spoil the series’s great story and interesting characters. Right, let’s get started with this then, the latest omnibus from Black Library, and this time, it’s by Anthony Reynolds, who was responsible for the popular, hard to find Word Bearer Trilogy, which is being republished as an omnibus in 2012. Knight Errant is the first in a series of five books (Two Novels, two Novellas and one short story which isn’t mentioned on the cover), and focuses on the young Calard of Bretonnia, and is Anthony Reynolds’ first ever novel. Basically, Knight Errant is about a Beastmen invasion of the Arthurian style realm of Bretonnia, and a band of knights, including cousins Bertelis and Calard, trying to stop it. I found the first instalment in this omnibus very hard to get into, for I found it hard to like the characters and the novel slow to start off with, but once I got going, I was thrown into an awesome, action packed read with plenty of light-hearted humour to keep the reader interested. I don’t know about you, but this novel kind of reminded me of Lord of the Rings: The Two Towers, especially towards the end. No, there may not be any Urak-Hai in this novel, or Helm’s Deep, but it still seemed similar. Anyway, moving on, if you’d like to take a look at the cover of this omnibus for a sec, it’s amazing. A Knight, complete with sword and a shield, who is presumably Calard, looking at the reader as they pick up the book. Yeah, as I said, awesome. 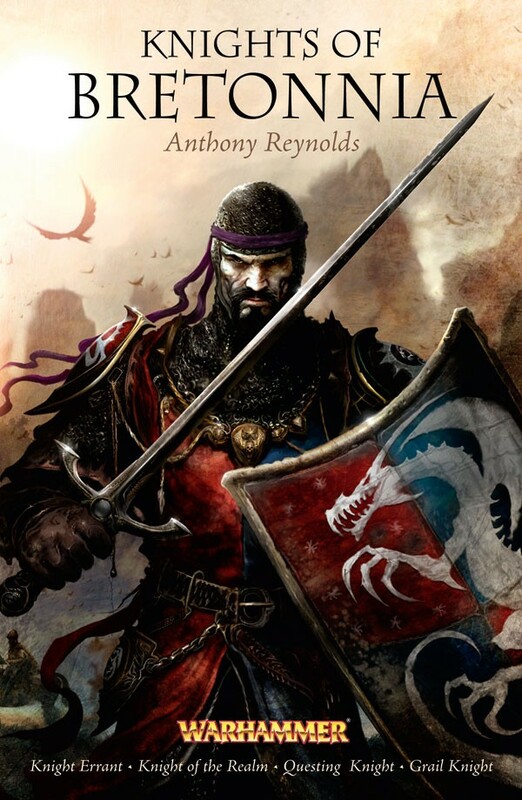 Occasionally during Knight Errant, Anthony Reynolds gives us a change of point of view, and rather than looking from the perspective of Calard, he gives us a taste of the enemy’s views, and this, in my view, helps to propel the storyline forward. And then, when not giving the point of view of Calard or the Beastmen, Anthony Reynolds enlightens us as to what life is like if you are a peasant in Bretonnia (Or in this case, a thief), by giving us the view of the unfortunate Chlod, who goes from one misfortune to the next. However, I found no evidence in this novel to suggest that the thief might eventually turn out to be Calard’s “Faithful Manservant”. Now, finally, Knight Errant ends on a massive cliff-hanger that really makes the reader want to read on to Knight of the Realm to find out what happens next. Knight of the Realm is the next instalment in the Knights of Bretonnia omnibus, and picks off where Knight Errant left off, again focusing on the Beastmen as the enemy, and again dipping between Calard, the enemy and Chlod’s point of views, as we look at the next stage in these epic adventures. This novel sees many aspects that weren’t concluded in Knight Errant come to a close here, as this is full of twists and turns, particularly, one huge one towards the end that you won’t see coming, and again, the novel leads us to another, climatic conclusion that will once more leave you desperately wanting to know what Calard gets up to next. Another thing that’s good about Knight of the Realm, is the fact that if you enjoyed one of the characters in Knight Errant, the majority of them (apart from the ones that died, of course), return in this sequel. There were some fantastic moments in this book, and again, I was reminded of Lord of the Rings here, but of the charge of Théoden at the Pellenor Fields this time, when the Knights of Bretonnia charge into the Skaerlings. Once more, I found myself enjoying the personality of the ‘bad guys’ in this novel, as Anthony Reynolds, in my opinion, makes the reader like them just as much as Calard, and I’m looking forward to read the Word Bearers Omnibus, to see his take on Chaos Space Marines, when it comes out in 2012. In my opinion, due to the even more epic stuff in this novel, Knight of the Realm is much better than Knight Errant. Right, we’re out of the two novel-arc that began in Knight Errant and Knight of the Realm, and gives us a chance to see Anthony Reynold’s take on a different enemy, this time, a Wyvern that doesn’t seem to stay put, and sees Calard (with Chlod at last), take on the beast near a small Empire/Bretonnia border, as he attempts to become a Grail Knight. We’re restricted to a lot less characters than the previous two novels, with the only point of views here being Calard and Chlod (if am not mistaken), and this gives Reynolds a chance to explore their characters a bit more. Although this is a short story, meaning I don’t have much to say about it as I would normal ones, Rest Eternal is another great read, as Reynolds keeps the plot twists new and great to read. Unfortunately, the major low point in this story was that I found this hard to get into, as once again, the characters were still hard to get to like. This short story was previously available in Death and Dishonour, a Warhammer Fantasy short story collection edited by Nick Kyme and Lindsey Priestly. Well, the penultimate adventure in this omnibus sees Calard and Chlod return once again, as the main characters, having returned home, to their castle of Garamond, only to find it in ruins. What follows Calard leaves him on what promises to be his most shocking adventure yet, as old friends and rivals return once again, although they are no longer who they were before. Questing Knight delivers a nice action scene, particularly the final fight, as Calard is neither pitted against Wyverns, Beastmen or Greenskins (who featured in one of the earlier stories), but the undead. There are some great moments in this novella, particularly the final fight which I enjoyed, because I didn’t see it coming. Overall, probably my favourite out of the bunch. At last, we’ve nearly reached the end of this review, and I’m going to finish with what looks like the final instalment to feature Calard, as he takes one final lunge towards the legend he’s set to become. There are also a few grammatical errors throughout the omnibus, in particular, one pointed out by fellow TFF member Lord of the Night in this novella, where Calard’s two named horses, Gringolet and Graibor are mixed up. Grail Knight delivers a final, triumphant ending that the whole series, right from the start, has been building up to, as it sees Calard of Garamond take on one, final quest before he completes his journey. There are some great scenes in this final novella, especially the epilogue, which was really nice to read. However, I didn’t find that it matched up with Questing Knight though, mainly due to the error but also because I loved the fight scene (readers of the book will know what I’m talking about), in Questing Knight. Should you buy this Omnibus? If you’re a fan Warhammer fantasy, Bretonnians, Lord of the Rings-style action scenes, a variety of action and enemies (aside from the first two novels, really), then this omnibus is for you. Egil Styrbjorn is the best Chaos Lord BL’s ever put out.